You are here: Home / Blog / World Day Against Child Labor: Just Say NO! World Day Against Child Labor: Just Say NO! No to child labor in domestic work! GENEVA (ILO News) – An estimated 10.5 million children worldwide – most of them under age – are working as domestic workers in people’s homes, in hazardous and sometimes slavery-like conditions, says the ILO. 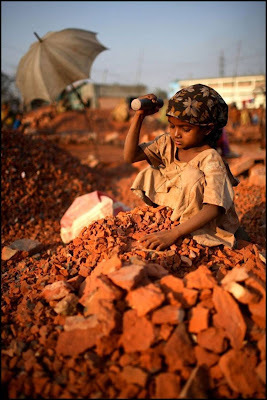 Six and a half million of these child labourers are aged between five and 14 years-old. More than 71 per cent are girls. According to the latest figures in a new ILO report, Ending Child labour in domestic work, they work in the homes of a third party or employer, carrying out tasks such as cleaning, ironing, cooking, gardening, collecting water, looking after other children and caring for the elderly. The International Labour Organization (ILO) launched the World Day Against Child Labour in 2002 to focus attention on the global extent of child labour and the action and efforts needed to eliminate it. Each year on 12 June, the World Day brings together governments, employers and workers organizations, civil society, as well as millions of people from around the world to highlight the plight of child labourers and what can be done to help them. Legislative and policy reforms to ensure the elimination of child labour in domestic work and the provision of decent work conditions and appropriate protection to young workers in domestic work who have reached the legal working age. Action to build the Worldwide movement against child labour and to build the capacity of domestic workers organizations to address child labour. Gandhi Worldwide Education Institute: Sponsor the Children Fund – The Gandhi Worldwide Education Institute (GWEI) has a vision: provide the imperiled children of India with a safe place where they will be housed and fed while they receive training to prepare them for a life outside the prison of poverty. Announcing: New Gandhi Tour Grants for Youth!